The Indian Equity Markets remained much weaker today and continued with its slide as the benchmark NIFTY50 ended the day with net loss of 95.05 points or 0.93%. 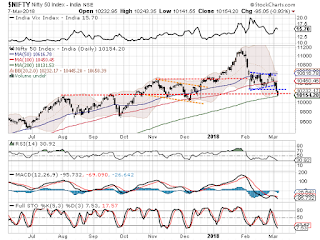 What was technically important today was that the NIFTY tested its 200-DMA which is expected to act as major support. The 200-DMA level stands at 10131. Markets currently remain precariously poised. 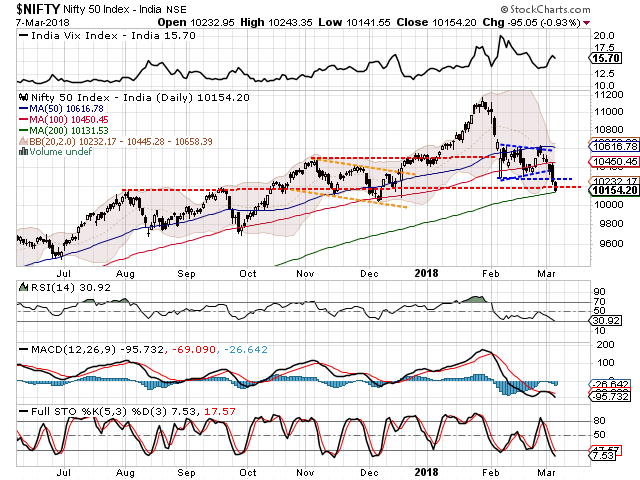 The weakness was dominant on Wednesday’s trade as the NIFTY showed no inclination to pullback despite being whisker away from the major support zone of 200-DMA. While we approach the trade on Thursday, we have to approach it with a two diverse facts in mind. First, the weakness in the general markets is not showing any signs of backing off. Secondly, the NIFTY trades oversold on major indicators and we have seen high amount of shorts that have been built in the system which can make short covering imminent. Thursday will see the levels of 10225 and 10270 acting as immediate resistance zone for the Markets. Supports come in at 10100 and 10010 levels. The Relative Strength Index – RSI on the Daily Chart is 30.9247 and it has got nearly oversold. It has marked a fresh 14-period low which is bearish. The Daily MACD stays bearish while trading below its signal line. No significant patterns were observed on Candles. Pattern analysis clearly indicates that the NIFTY has broken down from the brief trading range that it formed during it recent declines. It has breached the support zone of 10276-10300 and currently stands in extremely close vicinity of 200-DMA. If read in isolation, the structural weakness is now seen evidently on the Charts. However, what forces us to wait for a very imminent technical pullback is that the lead indicators are oversold. Coupled with this, we have created very significant amount of short positions over last couple of days. Further, if we look at all sector and broader Market indices, they all are either deeply oversold, or are seen taking support at its 200-DMA. In view of the above facts, we would strongly recommend trades to move out of any major short positions. There are chances of a technical pullback and the behavior of the Markets vis-à-vis the 200-DMA at Close levels will be immensely important. Resilient relative outperformance can be expected from select Auto, Metals and FMCG components.